This statistic shows the worldwide cement production, by major producing countries, from 2012 to 2018. In 2018, cement production in the United States amounted to some 88.5 million metric tons. Thus, the United States is among the global top three cement producers. 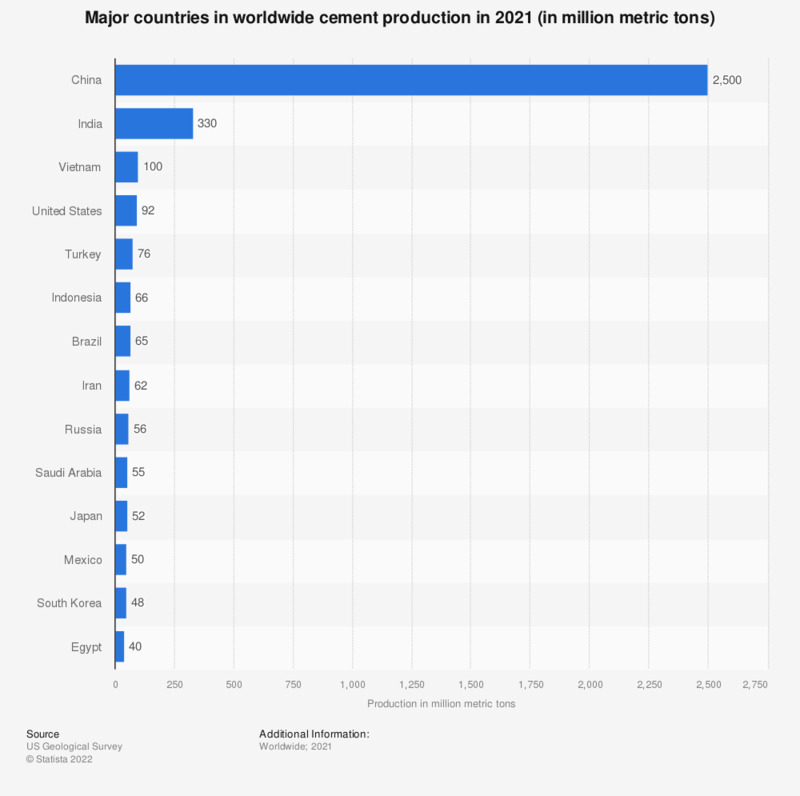 China produces the most cement globally by a large margin, at an estimated 2.4 billion metric tons in 2018, followed by India at 290 million metric tons in the same year. China currently produces over half of the world’s cement. Global cement production is expected to increase from 3.27 billion metric tons in 2010 to 4.83 billion metric tons in 2030. In China, the cement production in 2015 amounted to some 2.31 million tons. Cement is used to bind material together and is categorized as either non-hydraulic or hydraulic. Hydraulic cements are composed of silicates and oxides that can set and harden even when exposed to water. Cement today is mostly used as stucco for buildings in wet climates, as mortar for applications near sea water, and as part of developments for strong concretes. Cement consumption in the United States decreased after the 2008 economic downturn, down to 71.5 million metric tons in 2009. Since then however, consumption has gradually increased to an estimated 96.2 million metric tons in 2016. In the U.S., most cement is consumed between May and October. In Europe, CRH, a top cement manufacturer headquartered in Ireland, generated 23.6 billion euros in revenues in 2015.